Rory visited Ullswater Community College to meet with students taking part in the latest ‘Climate Strike’. These strikes were inspired by Greta Thunberg, a Swedish schoolchild who spent twenty days protesting outside the Swedish Parliament, calling for action on climate change. Inspired by her example, schoolchildren across the world have gone on strike in sympathy and in unison, in protest against the causes of Climate Change and the perceived inadequacy of the Government’s response. The last such action took place on 15 February and saw over 10,000 school children refusing to attend class, instead making signs and marching on government buildings. On this occasion, instead of leaving the school to protest, the students of Ullswater Community College assembled in the playground to raise awareness of increasing global temperatures and to call for change. Ella Purdy, one of the event’s organisers, invited Mr Stewart to meet with the students to discuss their concerns, and he was delighted to accept. 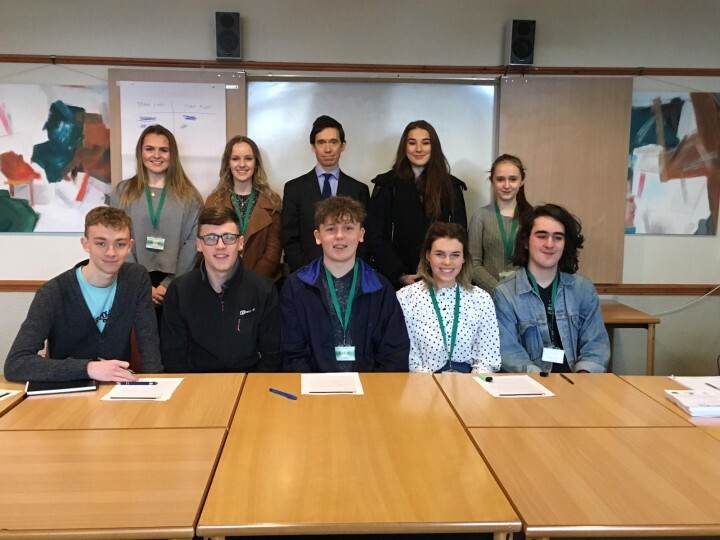 They engaged in a productive discussion, in which the students voiced their views and Mr Stewart explained the Government’s policy programme which has clear targets for major reductions in greenhouse gas emissions. They also discussed his voting record, and why the Government has favoured certain measures over others. At the end, the students thanked Mr Stewart for speaking to them. Rory said, “Climate change is one of the great challenges of our age, and it was wonderful to see so many students engaging thoughtfully with the issue. I was very impressed by their knowledge and their passion – both of which are a real tribute to them and their teachers. We agreed on the need to combat climate change, and it was interesting to hear their views on what the Government has done and what it should do. I look forward to visiting them again to continue our discussion in due course”.